You've found the “U.S. Shetland Duck Breeders” page here at Hobby Farm Wisdom! If this is the first time you have visited our site: Welcome! The Shetland ducks are a rare breed of domestic ducks that originate in Scotland. They are considered critically endangered. It is the third smallest native breed of ducks and they stand semi vertical. With great foraging skills, they are used to eating off poor marshy wetlands. They are energetic and are able to eat seeds, bugs and microbes. 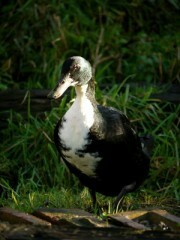 Both drakes and ducks are glossy black with a white bib and are used mostly for eggs, conservation grazing and agroforestry. They can also display some green/blue iridescent feathers on their bodies like the Cayuga. Drakes have yellow bills and females have black bills. They are lightweight birds with drakes weighing around 3.5 lbs and females 3 lbs. They lay white eggs.